Come Up and Play with Us! Editor’s note: It seems like every week brings a new race to Sonoma county, and training groups are sprouting everywhere, from Empire Runners and all the local running stores. Some are informal meet-ups, others are expos with demos from shoe vendors, some are paid groups targeting a specific type of running with a goal race to work towards. This all bodes well for our local, vibrant community. In the first installment of an ongoing series, we are highlighting some of the options from Healdsburg Running Company. In coming months we’ll hear from other running stores about their training offerings, plus an expanded roster of fun events from Empire Runners. A number of new running shops are turning back the clock and using the guiding principles that stem from running clubs and shops from the 1970’s. From Frank Shorter’s win in the Olympics, to women starting to run, to trail running, and other events that spurred on the start of Empire Runners club still holds true for specialty running stores and running clubs today. 40 years later, the resurgence of running is a re-creation of some of the same values that Empire was founded on. At Healdsburg Running Company (HRC) we call these values the 4 C’s: Community Building, Charity, Commerce Everywhere, and Camps & Tours. One of the oldest practices of community building is creating a welcoming environment and tapping into a common interest like trail running. HRC has community runs every night, but the shop focuses on three weekly runs: “Ladies Night”, “Family Night” and the Saturday “Trail Runs.” All of which start at HRC and end at a favorite winery, brewery, restaurant, yoga studio or community center. Every week has a different locale or theme. Ladies Night gathers 80+ women to run every Tuesday in a fun and safe environment. Family night of over 100 runners focuses on the kids and dogs joining the run and has themes like “running for gelato” while ending at a family-friendly bar or restaurant. HRC Trail Runs center on amazing places and parks – like Lake Sonoma, Armstrong Woods, Riverfront Park, or on private trails in the vineyards – with beer and food to follow at a community breakfast spot. To keep the runs open to all paces and types of runners, there is as much focus on the food and drink as much as the pace! In order to remain authentic and keeping with 1970’s running roots that started Empire Runners, charity work is needed to reaffirm and provide a sense of community. This also creates social capital to capture some more common interests beyond the running activity itself like changing lives. In a year of hosting film screenings, fun-runs, and participating in numerous fundraising events, HRC has raised nearly $14,000 for a few specific charities that club runners chose. This has included Wear Blue for Fallen Soldiers, Girls On The Run, Vineyard Workers Scholarships and Russian RiverKeeper, along with many local fundraisers for kids track teams and events. Similar to many running clubs, retail activity is not the sole focused at the retail store or club itself. Having a running lounge and meeting spot emphasizes the sense of community and education. Running shoes, apparel and nutrition are, of course, sold, but the focus is bringing the running store or elements of it out to all the events we are sponsoring, hosting or running. In a 24/7 online world, all new running stores sell in a multi-channel environment. 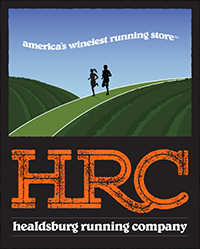 Running store products today are sold online as well as at alternative partner retail locations like wineries and bars that sell co-branded HRC running gear. The new emphasis is on integration along with education and awareness, not selling. Amazon sells, but specialty local shops educate! Being forward-looking and capitalizing on Ultra running and Sonoma County wine growth, HRC intends to host more “Running Camps.” Healdsburg Running Camps are four multi-day running vacations starting this fall along with two-day versions for the weekend visitors from the Bay Area. As America’s wineiest running store the camp’s focus is on running but also includes four different professionals runners, sponsored athletes, chefs, winemakers, and other local running guides. For example, a camp will include runners from Hoka One One, a chef from the famous Spoonbar Café, the California winemaker of the year, along with our top local Ultra runner who – all will run with our campers. We plan to show these running campers the unparalleled beautiful trails, amazing food, award winning wine and charm of our small town with a quaint stay – all centered around the trail run. It is the run, food, wine and stay of your life!